Dr. Caponi obtained his medical degree at the University of Illinois at Rockford in 2005. He completed his internal medicine residency at the University of Wisconsin Hospital and Clinics and joined the hospital medicine staff in July 2008 as a nocturnist. 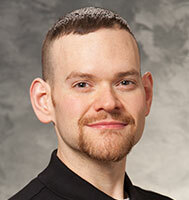 He then made his transition to a day position in 2010 and is currently a Clinical Associate Professor. Dr. Caponi is an award-winning teacher and clinician. He is active on the inpatient teaching services, and serves as one of two Medical Directors for Utilization Review and Case Management. Dr Caponi serves as an active member of the UW Health Hospital Medicine Leadership Core, the Clinical Knowledge Management Council, the UWHC Resuscitation Committee, the UWHC Nutrition Committee and numerous subcommittees, and has served as physician champion for multiple projects. He is also the director and presenter for the Department of Medicine Morbidity and Mortality conference and chairs the Division of Hospital Medicine's Mentorship Committee. His special interests are acute care training for students and residents, quality improvement and patient safety and peer teaching on utilization review issues.